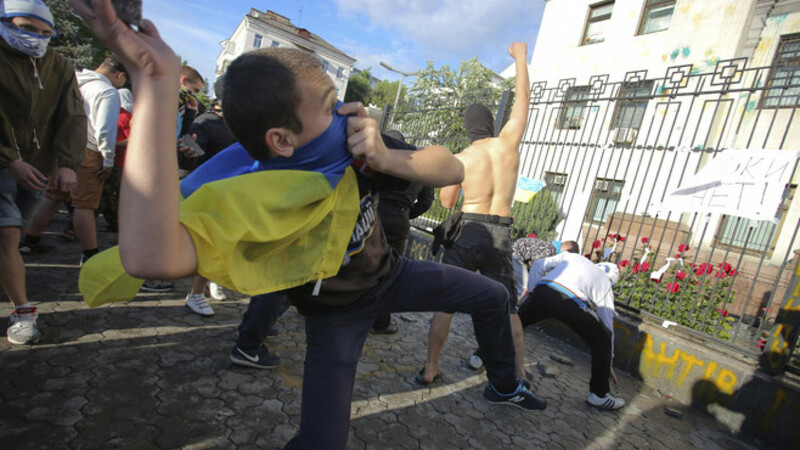 A protester using the Ukrainian flag as a mask throws objects into the Russian Embassy in Kiev on Saturday. Amid accusations of Moscow's support for the rebels in eastern Ukraine and the targeting by protestors of Russia's embassy in Kiev, the Ukraine crisis escalated over the weekend as pro-Russian rebels downed an airplane transporting Ukrainian forces after losing control of the port city of Mariupol. Ukrainian President Petro Poroshenko declared Sunday a day of mourning and vowed to punish the pro-Russian separatists responsible for shooting down a Ukrainian military transport plane, killing all 49 crewmembers and troops aboard. The death toll was the highest suffered by government forces in a single incident since the Ukrainian crisis flared in February and is likely to fuel tension between Russia and the U.S., which accuses Moscow of arming the rebels. Poroshenko promised an "adequate" response after the plane was downed as it came in to land at an airport outside of the city of Luhansk. “All those involved in cynical acts of terrorism of this magnitude must be punished,” Poroshenko said Sunday. Ukrainian forces on Friday reclaimed from rebel control the city of Mariupol, a major port for the export of steel. The Ukrainian flag was raised over regional government headquarters of the city of 500,000 that had long been a focus of clashes. Ukraine's presidential press service quoted the defense minister as telling Poroshenko that more than 250 rebels had been killed in the clashes. It was also not clear how the rebel death toll was reached by Kiev's pro-European authorities, and the separatists have scoffed at such high casualty estimates in the past. Five border guards were killed and seven wounded in Mariupol when their column of vehicles was ambushed, one day after Ukrainian forces recaptured the city. The Kiev government has accused Russia of permitting three tanks to cross the border this week into eastern Ukraine, where they were used by rebels. Russia denies supplying the separatists and says Russians fighting in Ukraine are volunteers. Moscow did not respond to the tank reports but instead accused the Ukrainian military of violating the border several times, including when an armored vehicle on Friday ventured about 150 meters into Russia. The Russian Foreign Ministry warned Saturday that if the incursions continued it would "take all necessary measures to suppress them." The U.S. State Department said Friday that its assessment was that separatists in eastern Ukraine had acquired heavy weapons and military equipment from Russia, including Russian tanks and multiple rocket launchers. In Kiev, demonstrators pelted the Russian Embassy with eggs on Saturday and desecrated a Russian flag in protest of what they believed to be Moscow's backing of separatist rebels in east Ukraine, witnesses said. In a statement released Saturday on its website, the Russian Foreign Ministry condemned the attack, accusing Ukraine of failing to protect the embassy and neglecting its international obligations. Russia has also urged the OSCE and UN to investigate the incident on the Russian Embassy in Kiev and prevent any further attacks on its diplomatic representation in the country.